-The class will be limited to no more than 1 person. -Will cover a 3 hour time period. -You will need to bring a small quilt of your own no larger than a crib size to quilt with your backing and batting. You will be sewing a large pantograph or free motion meandering on your quilt or table runner due to time constraints. Please keep in mind you are practicing and not quilting something that you have in mind for a gift. In class you will learn how to thread the machine, how to fill a bobbin, how to layer the backing, batting and quilt properly on the machine, how to use pantographs or free motion, how to start and stop the machine. THE CERTIFICATION CLASS FEE IS $60. THIS COVERS THE 3 HOURS OF CLASS AND PRACTICE TIME. 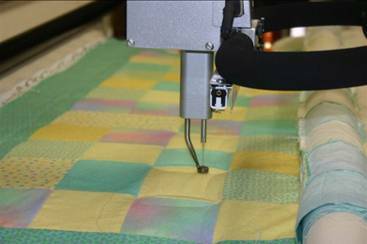 The use of a cleaned and oiled, state of the art Handi Quilter Fusion long-arm quilting machine with a stitch regulator. Use of the bobbin winder if you want to wind your own bobbins. Batting: You can bring in your own batting or purchase it from us. Just ask and we can help you find what will work best with your project. WHAT IF I CAN’T FINISH IN ONE SESSION? It will depend on how fast and how heavily you quilt. Once you’re more experienced you should be able to quilt a full-to-queen size quilt with an all-over pattern in a single session. MAY I RENT THE MACHINE FOR LESS THAN A FULL SESSION? will be available when you rent the machine. The cost is $15 and will include the following: loading of the backing, batting and quilt top onto the machine, full bobbins will be loaded for you and the machine will be threaded with thread color of your choice. The thread, quilt top, backing and batting must be dropped off a minimum of one day before your rental time. This is an optional service but it does cut down on the time to load your quilt during your rental when you can be sewing. If you have previously taken the introductory class at another shop, please call about waiving the certification class. You may send a substitute quilter in your place if: it is less than 24 hours before your appointment, if you notify The Quilted Nest and they have taken the introductory class within 6 months. Renter agrees to not adjust the tension, remove thread jams or replace needles without help from The Quilted Nest. Overtime fee is 10.00 per 1/2 hour past the 3 hour session. Renter agrees to operate The Quilted Nests' Long Arm machine and studio equipment at their own risk. Renter will not hold The Quilted Nest responsible for any injury caused to their person or damage caused to their quilt due to faulty operations.